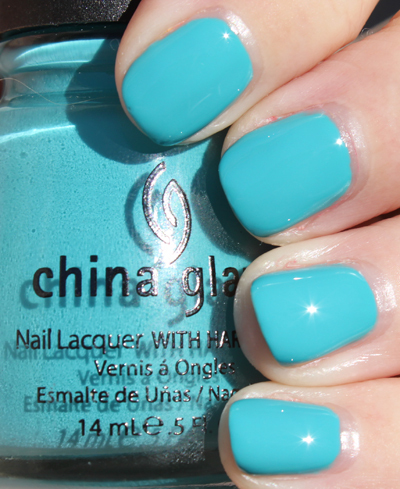 I have part II of China Glaze’s Up & Away spring 2010 collection for you today. These are also all cremes, but they are brights, not pastels like the ones yesterday. Needless to say these all applied a lot less streaky than the pastels did. They were mostly two coats compared to mostly there coats with part I. Peep ’em! 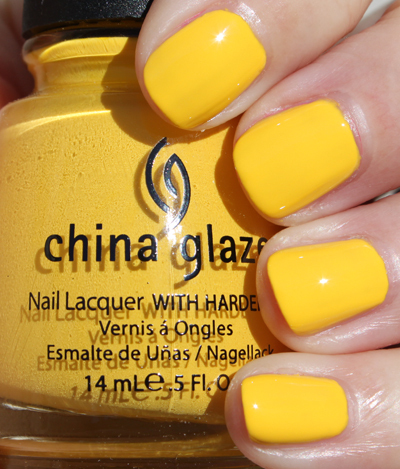 Happy Go Lucky is a sunny yellow that’s on the cusp of being too warm for me. This was much less streaky than Lemon Fizz, but Lemon Fizz looks better for my skin tone. Heli-Yum is a bright cherry pink. It’s really pretty and would make a great mani color I think. Flyin’ High is a vivid sky blue, and I love it. I always love these light blue cremes! 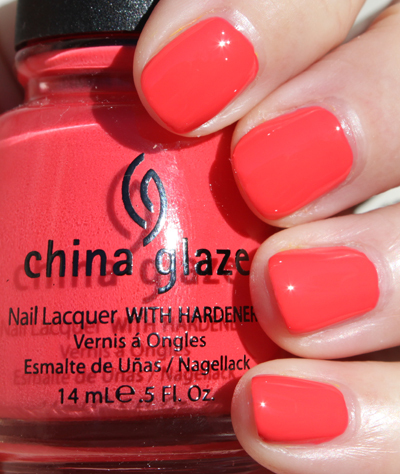 High Hopes is a pinky/coral but not too warm for me. I was surprised how much I liked this on. 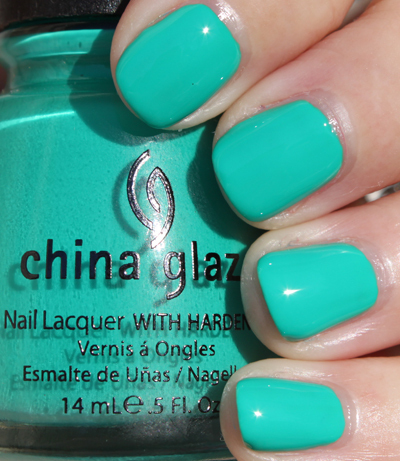 Four Leaf Clover is a green teal creme. This picture shows it as looking very blue, but in real life it’s a lot more green. It’s hawt! Grape Pop is a grape purple creme. These colors always look fabulous on me, and this one is no exception! I can’t decide if I like these six or the other six in part I better! I really love them all, there isn’t a single one in the bunch that I won’t be wearing this spring and summer! Look for them in January online and in stores! Every time I see a swatch of Four Leaf Clover I want it more & more! Well, now that I’ve seen both sets of swatches…it’s official. I hands down NEED the entire collection. I read on ChG’s twitter page that this collection will begin to ship next week…it’s going to be a long week waiting! 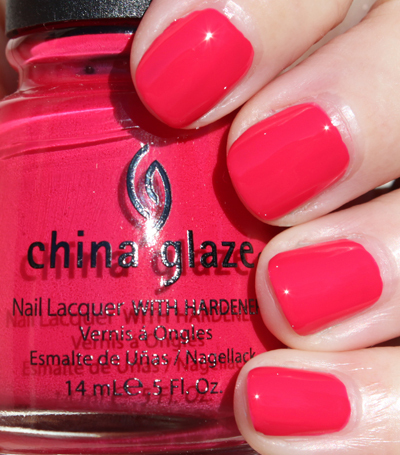 .-= AllYouDesire´s last blog ..China Glaze Black Magic =-. I’m so excited to get Grape Pop and Four Leaf Clover, they are gorgeous! .-= Andrea´s last blog ..A love affair with a fugly green =-. Grape Pop and Peachy Keen are the two I want the most. But I could easily go for more! I like this half of the collection better. I love Grape Pop. How does it compare to Mismas by RBL? .-= TipsToToes´s last blog ..Essie It’s Genius & OPI Black Cherry Chutney =-. I like these even better than the first half — I’m going to have to get all of these, I think. 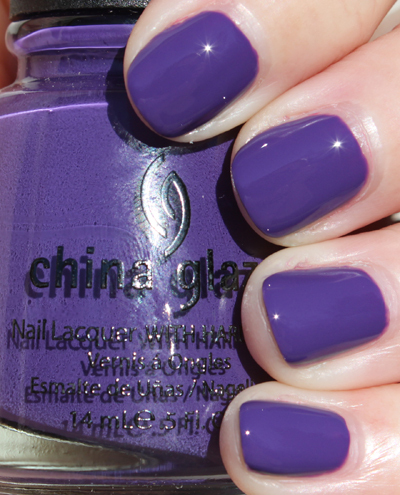 But I especially love Grape Pop, which looks like a shade of purple I don’t have, really a rich shade but not too dark. Also not a shimmer — it seems like a lot of my purples are sparkly. Not that that’s a bad thing! It’s just fun to have one different. I wonder how many Boston, MA fans will go on “First Night” to see all the ice sculptures. There was an article in today’s Globe about one of them and showed some of his work. Happy New Year everyone. .-= Laura´s last blog ..Merry Christmas!! =-. I love them all and I can’t wait for them to be available. This addiction is getting expensive, but I guess it’s a lot healthier than some other addictions. Love, LOVE, love Flyin High… very pretty on you. High Hopes, Four Leaf Clover and Grape Pop in that order. I’m suprised about the High Hopes, lovely shade of coral. Darn I love them all. They look fantastic on you.